We are celebrating becoming one of just four companies in the country, and the first practice of civil and structural consulting engineers, to be awarded with a coveted certification that will be mandatory in all public sector building projects from 2016. The Building Research Establishment (BRE) Building Information Modelling (BIM) Level 2 Business Systems Certification has been awarded to Adept following a stringent assessment process. 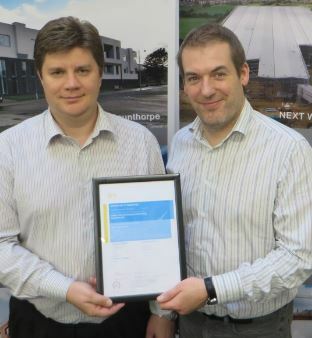 We are now BIM Level 2 certificated and therefore recognised as successfully being able to implement and utilise advanced 3D modelling tools in strict compliance with the Government’s strategy, meeting the requirements of PAS1192-2:2013 and table 8 of the PAS 91:2013 prequalification questionnaire document. Verified by BRE Global, Adept now has a certificate and entitlement to use a BRE Global BIM badge of compliance. Managing director Erol Erturan is a BRE BIM Accredited Professional and since 2013 we have used BIM on all projects regardless of size. Recent projects where we have implemented BIM include the £55m new Next Distribution Centre in Doncaster, the £20m Staycity Hotel in Manchester, the £12m refurbishment of Leeds Kirkgate Market, the new £9.5m Humber University Technical College in Scunthorpe and on residential projects for UK’s leading retirement housebuilder McCarthy & Stone and social housing organisations across the UK. Erol says: “BIM is a great way of demonstrating to clients that we have the right procedures in place at every level to deliver what are very rigorous Government requirements. It also simplifies the tendering process, as once a business is BIM certified its competence levels are guaranteed. “We are now one of just a handful of firms that have achieved this top BIM accreditation which is a fantastic achievement – especially as the majority of small to medium sized businesses are not at all prepared for the introduction of BIM Level 2 and face being frozen out of Government contracts as a result.